As it has in previous years, Apple has quickly followed up a major iOS release with a point-one release that promises not only to fix outstanding bugs, but also to bring new and wondrous features to the company’s mobile operating system. And this time around, those enhancements are hardly inconsequential: among other things they include a brand new social network (Apple’s second to debut in the last week), slick new camera functionality, and a handful of smaller tweaks that you might not have noticed. Like iOS 4 before it, 4.1 is compatible with the iPhone 3GS and iPhone 4, as well as the second-, third-, and fourth- generation iPod touch models. Unfortunately, the iPhone 3G is the black sheep of the family here, as it only gets some of the features of the new software. And the iPad remains out in the cold until iOS 4.2 finally brings these features, along with the rest of iOS 4’s capabilities, to Apple’s tablet in November. 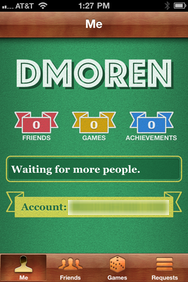 Game Center lets you play games with your friends or—if you have no friends, like me—get matched up against strangers. It’s unquestionably the biggest new addition in iOS 4.1: a brand new built-in app that capitalizes on the success of gaming on Apple’s mobile devices. Game Center is Apple’s answer to Microsoft’s Xbox Live and Sony’s PlayStation Network, a social service that helps connect gamers with their friends, earn achievements, and find opponents online. When you first launch the app, it will request you to confirm a few profile details and pick a username; Game Center uses your Apple ID to log you in, but you can add multiple e-mail addresses so your friends can easily find you (you’ll have to verify each address by clicking a link that Apple sends you). Once you’ve registered your account, the app lets you view your list of friends and their respective statuses, browse a list of Game Center games, and set your own status. Apple says you’ll be able to download Game Center-capable games directly from the app, as well as start sessions, but I wasn’t able to check these out due to a lack of Game Center-compatible titles available prior to the software’s official release. Game Center will alert you with an e-mail, a badge on its icon, a pop-up notification, and a trumpet sound when someone requests to be your friend (hey, it’s an event, after all). In case you’re someplace that you’d rather not have the latter two going off willy-nilly, you can deactivate them under Settings -> Notifications -> Game Center. You can always view your list of outstanding friend requests in Game Center, and accept or reject them as you wish. You’ll also be able to earn achievements from games and view leaderboards to see how you compare to your friends and rivals. And you can also be auto-matched with strangers if none of your friends are available for a match. It’s a little early to see how Game Center will play out, if you’ll pardon the expression, as we’ll need to wait and see how developers integrate it into their titles. But given that the iPhone, iPad, and especially iPod touch have become surprisingly popular gaming devices, it makes sense for Apple to build an infrastructure to encourage the market. There’s one caveat, however: not all iOS devices will get Game Center. Only the iPhone 3GS, iPhone 4, and second-, third-, and fourth-generation iPod touches are eligible at present. Given that neither the original iPhone or iPod touch supports iOS 4, it’s mainly the iPhone 3G that’s getting left out in the cold. For more, check out what my colleague Chris Holt has had to say about the importance of Game Center elsewhere on the site. 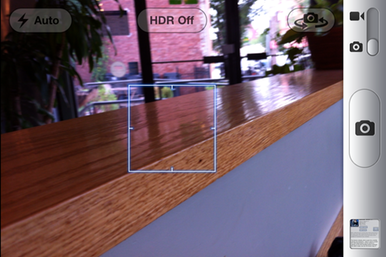 To activate the iPhone 4's HDR photo feature, just tap the button in the Cameras app. Another major improvement that Apple CEO Steve Jobs touted during last week’s unveiling of iOS 4.1 is support for high dynamic range photos. This new feature appears to be limited to the iPhone 4, no surprise given that the phone’s camera is the most capable among all of Apple’s mobile devices. When you enable HDR and take a picture, the camera actually snaps three pictures: a picture at normal exposure, an underexposed picture, and an overexposed picture. It then combines all three of these images into a single photo, which can often yield startlingly impressive—though sometimes unreal-looking—images. If you want to keep non-HDR versions of the photos you snap, flip this switch in Settings -> Photos. In 4.1, you enable the feature by tapping the HDR button, which sits in between the flash control and the front/rear camera toggle—activating HDR automatically switches the flash off. You’ll also be prompted as to whether or not you want to keep the normal version of the photo in addition to the HDR (you can also toggle this on and off in Settings -> Photos). Elsewhere on the site, our digital photo expert extraordinaire Heather Kelly gives the skinny on HDR and what it means for iPhone photos. Apple's new music-focused social network, Ping, is now part and parcel of the iTunes app. iOS 4.1 brings a pair of updates to the iTunes app, though if you’re running iOS 4 right now, you’ll already have one of them: the inclusion of Ping. Apple’s new music-focused social network arrived last week as part of iTunes 10, and Apple quietly updated the iPhone and iPod touch versions of the app to match (Ping is not yet available on the iPad, however, which will have to wait until iOS 4.2 arrives in November). Ping on the iPhone has most of the same features that you’ll find on the Mac and PC. You can view recent activity from your friends and artists you follow, see your list of followers and people you follow, and take a look at your own profile—in case you’ve forgotten what kind of music you like. 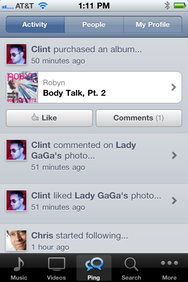 In addition, you can write comments and “like” music either from your friends’ posts or from elsewhere in the store. The second improvement in iTunes is the addition of TV show rentals. Apple’s offering rentals of episodes from a few sources, including Fox, ABC, and a handful of others. However, Apple’s squirreled away rentals a bit, so it might not be obvious at first blush how you find them. 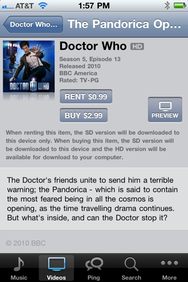 You can now rent TV shows on your iOS device through the iTunes app. In the iTunes app, you need to visit the Videos section, which is either accessible via the toolbar at the bottom or by tapping the More button. Then, tap the TV Shows header at the top and pick a show that’s rentable—let’s say the BBC’s long-running Doctor Who, for example. Scrolling down to the list of episodes will show that the familiar Buy buttons have disappeared—tapping any episode will play a preview; to actually rent it, you have to double-tap to view info for that episode. Mark this one down as a poor interface choice on Cupertino’s part. Keep in mind, however, that if you rent a TV episode on your iPhone 4 or fourth-generation iPod touch and and then try to transfer it to your Mac or PC, you’ll run into a wall of Apple’s construction. In addition, those two models are also the only iOS devices that support HD rentals. The Photos app now lets you upload in HD to both YouTube and MobileMe. The iPhone 4’s camera is capable of shooting high-definition video at 720p, but up until iOS 4.1 the only way to get that video off your device at full quality was to transfer it via USB to your Mac or PC or rely on third-party apps. Now, users will be able to upload their videos in HD to either YouTube or Apple’s MobileMe service right from the iPhone’s Photos app. 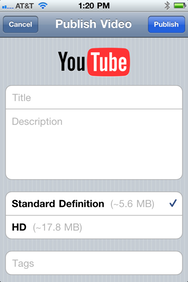 You can still opt to upload the standard definition video if you prefer—in fact you’re required to if you’re using 3G since HD uploads require a Wi-Fi connection. iOS 4.1 isn’t just about adding features, though—it’s also about swatting a couple of pesky bugs. Chief among those is an issue reported by many users about the iPhone 4’s proximity sensor. That’s the little piece of hardware that lives just above the phone’s earpiece which detects when you hold the phone up to your face during a call and deactivates the touchscreen to prevent accidental input. iOS 4.1, for what it’s worth, seems to improve the problem in most respects, but it still can't compensate for running on hardware that is a lot less powerful than what the current crop of Apple’s devices offers. Long in the tooth: Despite supporting Bluetooth audio via A2DP since iPhone 3.0, remote control wireless functions have been limited to Play/Pause and volume adjustments. My colleague Dan Frakes confirms that iPhone 4.1 finally brings the whole kit-and-caboodle of Bluetooth’s AVRCP protocol, allowing you to jump to the next or previous track using your Bluetooth audio accessory. Restrictions now includes the ability to deactivate FaceTime and multiplayer games (via Game Center). Parent trap: In addition to the usual line-up of parental controls under Settings -> General -> Restrictions, Apple’s added a few extras in this update. 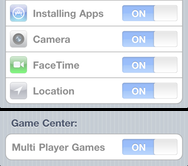 Parents can now also disable FaceTime and Game Center’s Multi Player Games feature. Spelling is optional: For those who don’t care to see their writing covered in squiggly red lines, you can now deactivate iOS 4’s spell check under Settings -> General -> Keyboards. The International: iOS 4.1 adds one new software keyboard layout—Cherokee—but also loses the calendar format for the Republic of China, for some mysterious reason. 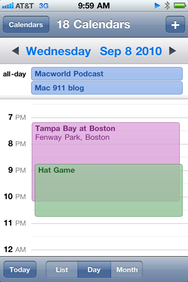 The Calendar app is showing its softer side with a more pastel palette. Pretty colors: The Calendar app has dropped the shiny colors for different calendars and events, replacing them with somewhat more pastel tints. Class attendance: If you don’t have any iTunes U content in your iPod app, you can jump straight to the iTunes U section of the iTunes Store by tapping on a little arrow icon that will be displayed. Familiar faces: You can also now add FaceTime contacts as Favorites in the iPhone’s Phone application. Tap Add to Favorites in any contact record or the Plus button on the Favorites screen and pick a FaceTime-enabled contact: if it’s a phone number (as opposed to an e-mail), you’ll be prompted to pick whether you want it to be a Voice Call or FaceTime contact. Overall, iOS 4.1 is a worthy update that packs both new capabilities as well as improvements to existing features—and all for free, too. With the performance improvements, even iPhone 3G users will find something to like in 4.1. As with most of Apple’s iOS updates, there’s pretty much no reason not to upgrade to the latest version, especially if your device of choice is an iPhone 4 or 3GS.